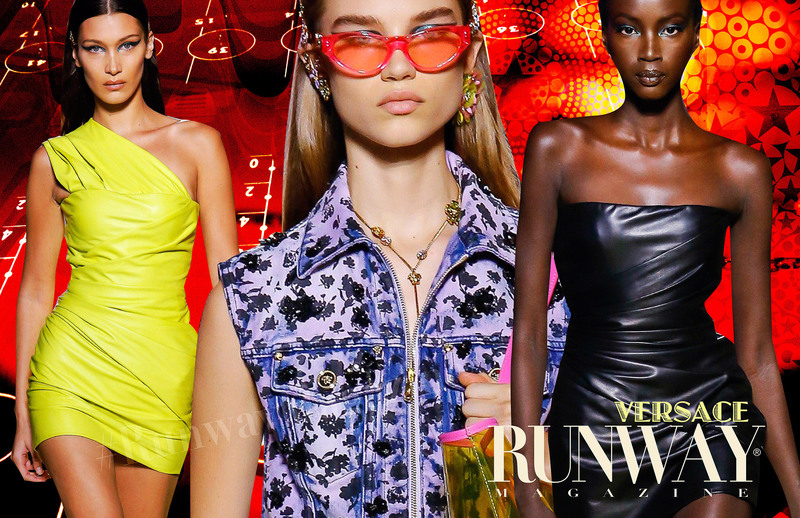 Versace Spring Summer 2019 Milan Fashion Week. 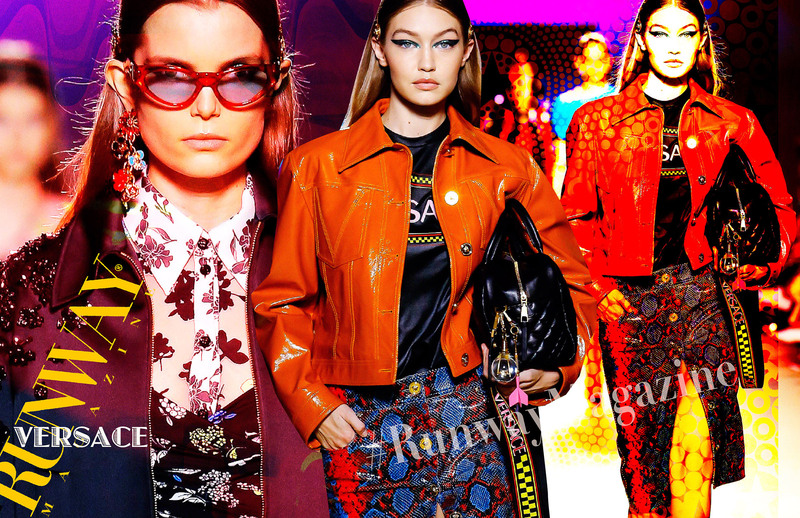 Donatella Versace deftly modernized her brand’s heritage in an impressive spring collection. “She is always THAT woman. The one who is never afraid.” So read Donatella Versace’s program notes, words that could have been penned about the designer herself. But then, to a palpable degree, Donatella has always been her own muse, her innate fearlessness expressed most obviously in her career-long celebration of women’s sexuality. It’s her last season, and last show. September 25th 2018 Donatella sold her brand to New Yorker Michael Kors for approximately $2 Billion. No one knows the reason for this decision, Donatella only said on social media today that she is staying put and the brand will still be Italian — and have glamour and daring identity for which this brand was always loved. This decision took quiet long time to take. But apparently it was in discussion for quiet some time. For the Fall Winter 2018-2019 season Donatella took designers of her brother genius Gianni Versace and modernized them into bombers and shirts. For her last season show showed her BEST OF. Yet there’s more to fearlessness than strutting your stuff. (Although as she proved with her bow, the woman still works a stiletto with the best of them.) There’s the fearlessness of proactive evolution, and of staying true to self in uneasy times. The two may sound antithetical, but they’re not. 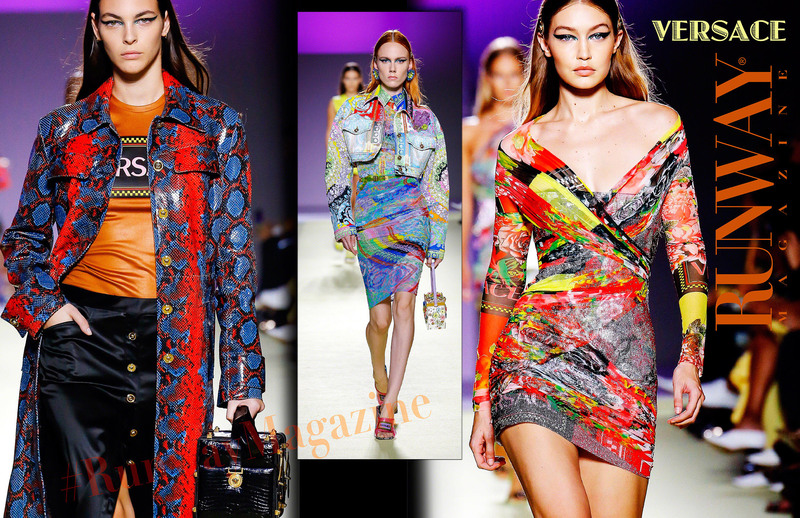 In the collection she showed in Milan, Versace proved her propensity for both. First, the evolutionary tide. 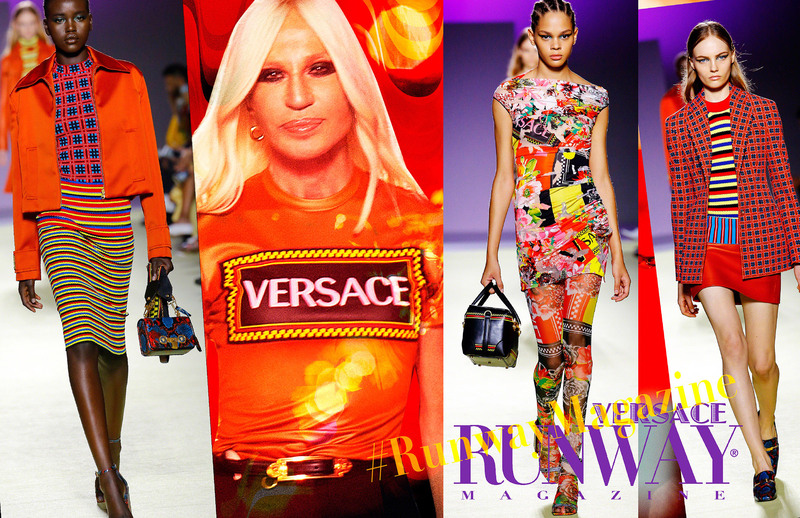 True to the Versace heritage, this was an upbeat, effervescent collection, filled with notice-me clothes worked with euphoric color and pattern and a specific silhouette — body con. 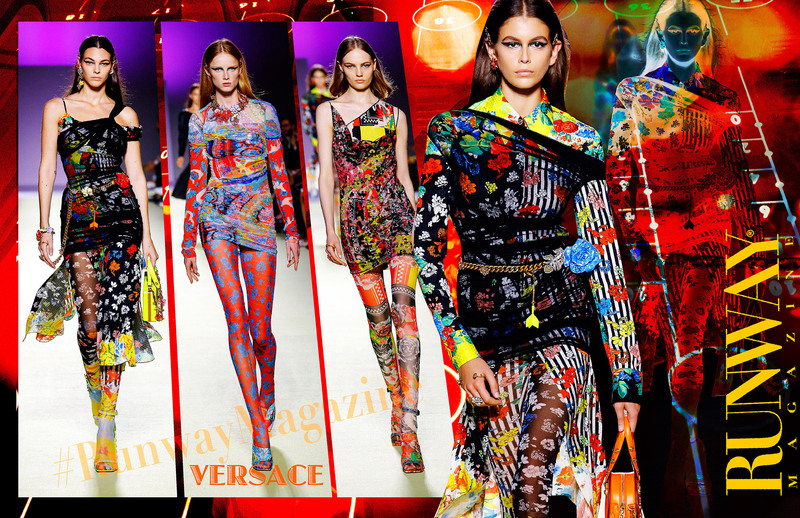 Yet whereas once Versace would have rendered that combination as aggressively sexual, recently she has turned down the heat, and this spring, significantly so. For starters, while her models were not undone (I mean, come on), they were significantly less done, particularly in the coiffeur category, the mega blowouts of yore gone in favor of more casual looks. Thus simplified, Versace’s beautiful young women (and less young — the incomparable Shalom Harlow closed the show) wore mixed stripes and checks with sporty élan (and a dash of Nineties), until they gave way to an exploration of weightless layering, dotted and floral transparencies twisted, turned and draped around the body, sometimes atop legs veiled in similar patterns. The takeaway: sensual eccentricity. 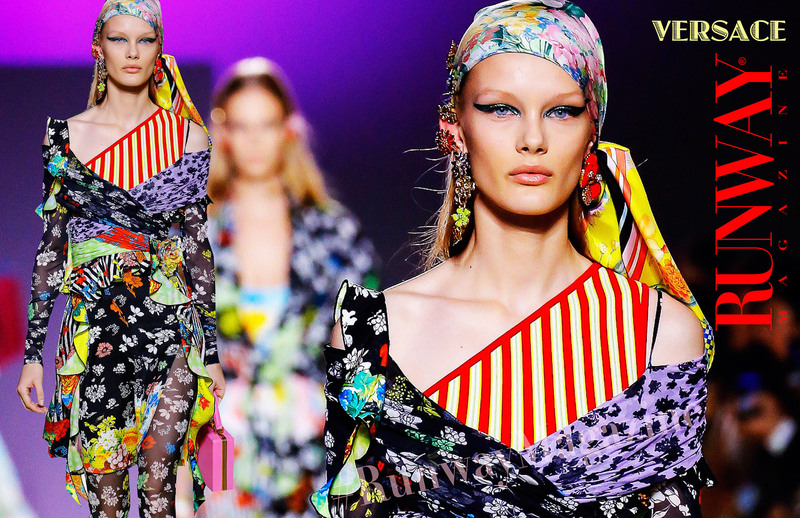 The collective spirit centered on reworking Versace microfloral prints—unusually soft and fluttery at times—that were swathed and draped into club-worthy body-con shapes. It used to be that Amazonian Versace glamour dictated towering heels with everything. Now, not so much. Girls in teeny-tiny chain mail or leather dresses are just as likely to want to go dancing in trainers as ankle-strap sandals. There was something about the way Bella Hadid walked around in her one-shoulder fluoro-yellow leather dress—all legs and sneakers—which showed her genuinely at home with it, acting her age. Donatella is tuned into that reality. She also cut some incredible black satin dresses, plunging, slit, strappy, and asymmetric, to which only a grown woman can do justice. If it was a show which lacked theme, it made up for it in empowering variety. With hope that the best is yet to come with Michael Kors as the head of the brand.